The DPT-Board is perfect if you want to get your smart products on the market fast and without the need to design custom electronics. 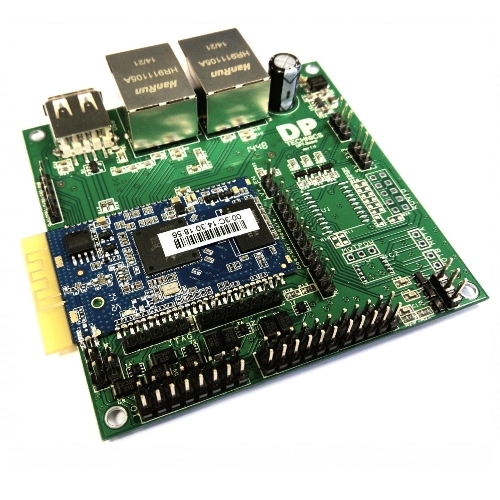 Together with our open source toolchain the DPT-Board can be the base of your new smart product. When some features need to be added to the board it's trivial to create a custom shield with the correct functionality. The DPT-Board features many interfaces typically found in digital systems. There are 8 mosFET outputs (1A @ 20V max) to drive relays directly from the board, dual 100Mbps ethernet port, USB2.0 port, SPI and I2C with built-in level shifter for 3.3V and 5V, high pseed UART, 3 high voltage (< 75V) inputs, JTAG, ... You can connect the board to virtually any peripheral you can imagine. Based on the DPT-Module-v1 the DPT-Board-v1 features the same Atheros Qualcomm AR9331 processor. This MIPS24Kc single core 400MHz processor has what it takes to control modern IoT applications. Combined with 64MHz DDR2 RAM memory there is more than enough power to encrypt and transfer data. The DPT-Board has been through extensive testing and was CE certified for both home and industrial use. This means you can use the module in your product without having to worry about certification. The integrated voltage converter on the DPT-Board is a high frequency switching regulator. By using this technology the DPT-Board uses only 0.45 watt even with WiFi enabled. Because of this low power usage there is not much heat generation and it's possible to use the DPT-Board in battery powered applications.